Which Weber Q is Best for You Video? The Weber Q portable gas grill was invented when Weber realized that many people were moving into the city where they wouldn’t have large backyards. Typically, people moved into apartments and all they had was a balcony for outdoor space. These small portable grills make for a great substitute in limited space as an alternative to a full-size grill. Portable grills are also great for bringing tailgating, to the beach, picnic areas, or campsites. Weber Q grills feature a lightweight cast aluminum body that’s rust resistant and durable. 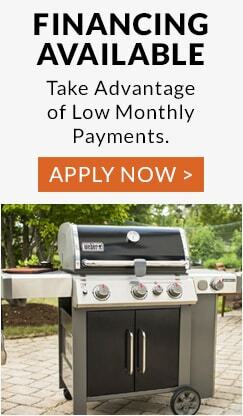 These grills have a unique, compact design that can be transported virtually anywhere and used in many outdoor situations where a full-size grill would be cumbersome. Though the Weber Q portable grills may be small, they’re powerful and their performance rivals that of many full-size grills. Weber has engineered several models of the Weber Q. We’ve outline some of the main differences to help you find the perfect one for you! The Weber Q 1000 is the basic model of the Weber Q portable series. But don’t let the word “basic” discourage you from buying this model. It’s considered a staple in the Weber world and is a great portable propane grill to own. The Q 1000 features a rust resistant cast aluminum lid and body, making the grill lightweight, but still durable. The ignition is an electronic push-to-start, so firing up the grill for a cookout is quick and easy. And for speedy clean up, it has a removable drip pan. You can cook about six burgers at a time on the Q 1000’s 189 square inch grilling surface. 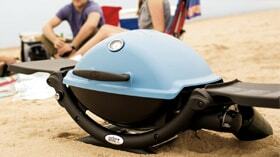 Weber Q 1200 Portable Gas Grill…with Colors! The Weber Q 1200 is built similar to the Q-1000 but has additional side shelves. The Q 1200’s lid is also fitted with a built-in thermometer. This model is available in eight different color options – so it’s sure to stand out at your next barbecue party! The Weber Q 2000’s cooking surface is 280 square inches and can cook up to 12 burgers at a time. Similar to the Q 1200, it also has side shelves. The Weber Q 2200 has the same features as the Q 2000, but also has the additional feature of the built-in thermometer. The Weber Q 3200 has the largest cooking area of all the Weber Q gas grills with 393 square inches of grilling space. It has a built-in thermometer and side shelves. The Q 3200 also comes with a stand for the grill, making it the only freestanding Weber Q model. This model also has a Grill Out handle light, which illuminates your grill for nighttime cooking. This grill is the only Weber Q that can be bought as a natural gas grill model instead of a propane gas grill only. It can also be hooked up to a 20-pound propane tank.